From Sun Sentinel: Some people say they were born 150 years too late. For them, cowboy action shooting gives them a chance to go back in time. The sport lets adults experience the old American West, but in a fun, safe way. They wear clothing and use firearms similar to what was worn and used in the mid- to late-1800s. 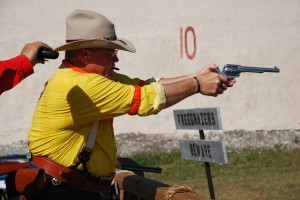 For some members of the Gold Coast Gunslingers, based at the Markham Park Target Range, cowboy action shooting lets them revisit their childhoods, when Westerns were popular in the movies and on TV and dressing up as a cowboy and shooting cap guns was a common pastime. Read more at sun-sentinel.com….